A Licensed Acupuncturist (LAc) is a highly trained professional who inserts fine needles through the skin to aid in the treatment of diseases and pain. Acupuncture is recognized by the World Health Organization as being able to treat a myriad of health conditions, including, but not limited to, chronic pain, cancer-induced treatment side effects, cancer symptoms, head aches, PTSD, stress, nausea, depression and many, many other conditions. No longer considered just complementary to Western Medicine, in Arkansas, Licensed Acupuncturists are considered primary care, and can diagnose and treat. Acupuncture has been practiced in China for thousands of years, and with today’s scientific advancements, we are able to study the variety of ways needling specific acupuncture points effects all the systems of the body. Typically acupuncture side effects are minimal, consisting mostly of tingling and rarely a small bruise at the insertion site. It is very unusual to experience any severe pain during Acupuncture. The needles are very thin and solid with a rounded tip to prevent cutting the skin. The primary goal is stimulate the body’s own self-healing capabilities to restore a state of health and well-being. This blog post is sponsored by Steel Creek Acupuncture. Chinese medicine is an ancient practice that dates back thousands of years and includes acupuncture, Chinese herbs, and several other modalities including (but not limited to) cupping, moxibustion, tuina, and gua sha. This holistic approach strives to bring the body into balance, or homeostasis, and can aﬀect all the systems of the body: nervous, digestive, urinary, lymphatic, immune, endocrine, reproductive, circulatory, respiratory, musculoskeletal and integumentary. By using signs and symptoms, tongue and pulse diagnosis, and other diagnostic tools, a skilled acupuncturist is able to use the the modalities of Chinese medicine to treat the root cause of the patient’s symptoms. Chinese medicine customizes treatment plans to the individual – what may be beneficial or harmful to one person may not be the same for another. The combination of acupuncture, herbal remedies, and nutritional and lifestyle advice helps to bring the patients’ bodily systems into balance – eﬀectively treating and preventing disease. Acupuncture is evidence-based medicine originating from a theory of energetic meridians, or pathways similar to the nervous and circulatory systems, throughout the body. The body responds in a variety of ways when diﬀerent points along these meridians are stimulated. Scientific research has shown acupuncture to stimulate changes in the brain and nervous system, changes in hormones, organ function, relaxation of muscles, increased circulation of blood, a decrease in inflammation, and many more eﬀects on the body. Not surprisingly, the research that is being done today is proving ideas about how to treat illness, injury and diseases that have long been known in Chinese Medicine. Who Can Benefit From Chinese Medicine? EVERYONE can reap the benefits of Chinese medicine – even babies! No matter your ailment, age, gender, or medical history, Chinese medicine can help. Even if you’re terrified of needles, there are many other modalities available such as Chinese herbs and other needle-free techniques like cupping and Tuina (Chinese massage). Keep in mind that each person’s healing response time and experience will vary, but this doesn’t mean that it can work for one person but not another. The beauty of this medicine is that it can be altered to meet each patients’ needs. Chinese medicine treats a variety of imbalances within the body. Techniques like acupuncture, cupping, and gua sha are proven to be highly eﬀective at treating acute or chronic aches and pains. Acupuncture, sometimes with the use of herbs, is an eﬀective treatment strategy for allergies, digestive issues, women’s health concerns, migraines, respiratory disorders, insomnia, smoking cessation, and almost everything else under the sun. You can visit your acupuncturist for ANY non-emergency concern. As long as you are seeing a licensed and fully trained acupuncturist (find one at nccaom.org), acupuncture is safe to do every single day. While there are usually no negative side eﬀects, some people become relaxed enough to have a nap during treatment and most people report feeling more relaxed with a sense of euphoria following treatment. These reactions are normal due to the acupuncture triggering the body to release endorphins and other “feel-good” chemicals the body naturally produces. Chinese herbs are taken internally, and may or may not have side eﬀects depending upon what formula is used and what you are being treated for. It is very important that you tell us all the medications you take. You should closely monitor how you feel while taking Chinese herbs, and contact your practitioner if you have any questions or concerns. “I would try acupuncture, but I’m afraid of needles.” Does this sound like you? Usually when the word needle is used, patients immediately think of the hypodermic needles used to give shots – and those do hurt! Acupuncture utilizes individually packaged, one-time use, hair thin needles. In fact, up to 40 acupuncture needles can fit inside the tip of a hypodermic needle! They’re so thin that most patients do not feel their insertion. You may feel various sensations as the acupuncture point is activated: tingling, itching, warmth. If at any time these sensations cause discomfort, let your acupuncturist know. The needle can be easily repositioned to ensure you achieve ultimate relaxation during your treatment. The eﬀects of Acupuncture are cumulative. While you should experience a change in symptoms following the very first treatment, it usually takes several treatments to achieve the desired results. If you are taking herbs and practicing self-care at home, the healing process will go more quickly. Most first-time patients come to acupuncture as a last resort for pain. They have typically been living with their pain for many weeks, months, even years. Based on the history and severity of symptoms, these patients may need to come two or three times each week until pain relief begins to have a more lasting eﬀect. For many other health issues, the patient will most likely receive acupuncture weekly and for mild symptoms or recent onset of symptoms, the patient should only need 1-3 treatments. 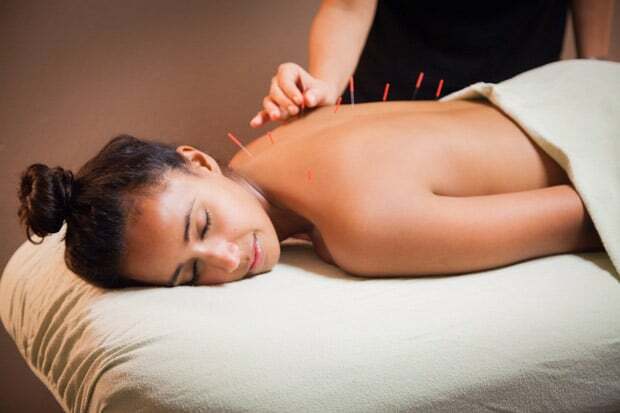 Have you always wanted to to try acupuncture? We would like your local acupuncturist in Northwest Arkansas. Jana is a native Arkansawyer who graduated from the University of Arkansas and moved to Tucson, Arizona to pursue Master’s degrees in Acupuncture and Chinese Medicine. She was led to pursue acupuncture when she experienced its powerful effect on her own pain and became intrigued by the many uses of acupuncture and herbal medicine. In 2011, she graduated from the Arizona School of Acupuncture and Oriental Medicine and opened Steel Creek Acupuncture in downtown Fayetteville, Arkansas. Jana has continued to pursue higher education and became Certified in Sports Medicine Acupuncture. In 2017, she earned her Doctorate in Acupuncture and Chinese Medicine from Pacific College of Oriental Medicine. She has served as Vice President of the Arkansas State Board of Acupuncture and Related Techniques since 2013 and is a member of the Academy of Integrative Pain Management, Acupuncturists Without Borders, Arkansas Society of Licensed Acupuncturists, American Association of Acupuncture and Oriental Medicine, American Society of Acupuncturists, and the National Certification Commission for Acupuncture and Oriental Medicine. While treating acute and chronic pain is her specialty, she still treats a wide variety of patients, including women’s health, respiratory health, allergies, migraines and other non-emergency ailments and illnesses. Whitney first became interested in acupuncture after finally finding relief from a lifetime of digestive pain. Western medicine just offered antibiotics with no answers. Acupuncture and Chinese herbs not only provided pain relief after the first treatment, but with continued care care and nutritional advice Whitney is now free from constant digestive pain and irregularity. She is passionate about sharing this medicine with others and letting people know that symptoms like constipation, diarrhea, acid reflux, and stomach pain do not have to be a lifetime struggle. Whitney has her undergraduate degree from the University of North Texas and attained her Master’s degrees in both Acupuncture and Chinese Medicine from the Colorado School of Traditional Chinese Medicine in 2016. She is a member of the American Association of Acupuncture and Oriental Medicine (AAAOM), Arkansas Society of Licensed Acupuncturists, and Acupuncturists Without Borders. Steel Creek Acupuncture has been providing high quality, evidence-based natural health care to Northwest Arkansas since 2011. Jana Brady, L.Ac., DACM, C.SMA is the only Certified Sports Medicine Acupuncturist in the tri-state area and became one of the first acupuncturists to earn the title of Doctor of Acupuncture and Chinese Medicine in the state of Arkansas. In Spring of 2018, Whitney Dwyer, L.Ac., Dipl.O.M. joined the clinic. Whitney specializes in digestive health and helping patients achieve their weight loss goals. She has her Master’s degrees in Acupuncture and Chinese Medicine from the Colorado School of Traditional Medicine. Our clinic offers acupuncture, fire-cupping, moxibustion, herbal prescriptions, dietary and nutrition therapy tailored to the individual patient’s needs. In 2019, we are remodeling and relocating to a new facility (117 W Sycamore) where we will once again offer massage therapy as well as an expanded retail section for essential oils and locally made herbal goodies. For now, we are still at 840 N. Pollard Ave. in downtown Fayetteville and can be reached at 479-301-2307.